Driving up our driveway just at dusk after a day of downpours of rain in upstate South Carolina, turning to go into our carport and I see a little lump on the ground that is hopping. Once it noticed the headlights it flew up to our cherry tree, I thought at first it was a small hawk buy the way it took off, but the shape was wrong…a little too small and round looking. I got out…left the car running and went to grab the camera out of the hatchback. Luckily, the Sony A7III was sitting ready with the 100-400 on it. 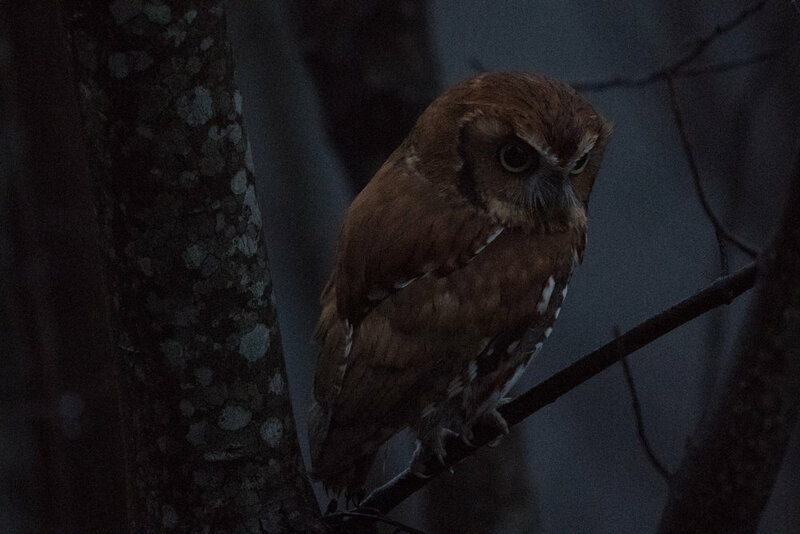 I quickly adjusted the ISO to 6400 and as soon as I brought the camera to my eye I could tell it was a screech owl. I was excited to get a shot but it immediately dropped back down to the ground about 10 feet in front of me. I guess it missed what it was after and it again flew over to another tree in the yard landing about 6 feet up on a branch. This was my chance and I took a couple of shots quickly, and realized that my settings were wrong. First shot taken - definitely not the right settings, even though I’m already at iso6400. I adjusted the exposure compensation to -2 stops to match the level of light outside (knowing that I could recover shadows pretty easily with this camera), increased my shutter speed and took a couple more shots….this time I got a couple of good ones off but the light was disappearing very quickly. Best shot that I got at ISO 6400, had to drop the exposure -2 stops while taking the shot but with the Sony A7III I was able to bring it back up without loosing too much detail in the noise. I increased the ISO to 25600 and aimed again. At this point the autofocus was struggling, but was still managing to grab the subject and I took another dozen or so shots before the owl took off again. Sample of shot taken at iso25600, dropped 2 stops in exposure. This is how most of the shots looked before processing. It went into our back yard and started a whinny and a few trills. I then noticed an answer about 30 feet off behind our house. At this point it was too dark for pictures so I just listened to them chatting for a few minutes before they both took off into the woods behind the house to continue the nights hunt. Like the last image but after some post processing, brought the exposure back up and applied some noise reduction as well as adding a bit of clarity. Not a horrible shot for the web, but I won’t be printing it anytime soon. 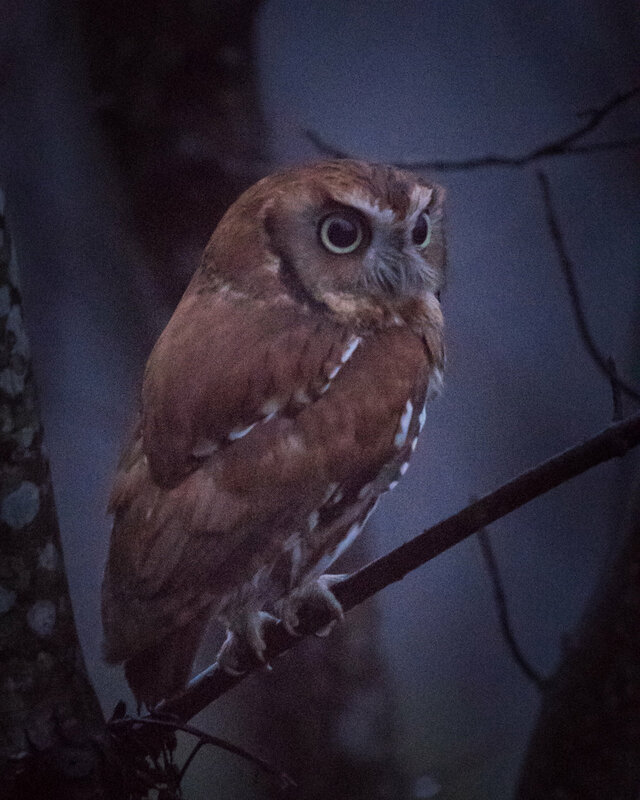 It wasn’t until I reviewed the shots that I realized that this wasn’t the same screech owl that comes to stay in a tree in our front yard regularly. That one is a pretty little grey morph, but this one was a beautifully coloured red morph…the first of that type I have seen and photographed. Sometimes the most interesting nature interactions have only luck as a basis for getting a shot…but I’ll take it anyway it comes.